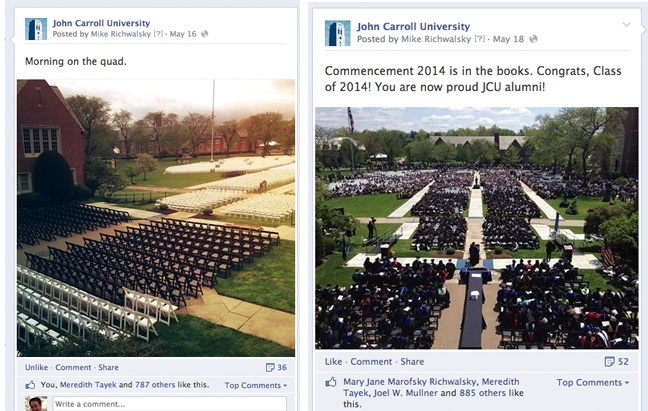 In the last two weeks, two photos I took on my phone have become two the of the most viewed photos in JCU’s Facebook history. Not bad for my little phone. For the last year or so, I have found myself shooting most everything related to our University’s social media using my iPhone 5. Compared to the dSLR we have in the office, I always have my phone with me and can quickly capture high resolution images and share them very fast. It’s even ben good enough for use in some of our print pieces. My workflow is pretty simple. I mostly shoot using the default camera app in iOS. I will sometimes shoot using Camera+, though I do a fair amount of photo editing and manipulation using Camera+. The other app I use for photo effects is Mextures. It has a wide variety of presets and guest-submitted filter combinations that are nice and often add a nice touch to photos. I used Mextures to enhance the photo of our Quad in the morning. If I’m shooting for Instagram, I’ll use Instagram’s built-in filters. I like that Instagram saves edited photos to the Photos app, so I can use them in Facebook, back them up to Dropbox and so on. I downloaded VSCO Cam after watching the video below, but haven’t had a chance to dig too deep into it. 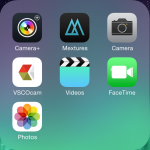 VSCO Cam is available for iOS and Android. I found this video from Dan Rubin, editor-at-large of the Photographic Journal, and The Guardian to be very helpful. It’s always neat to see someone else’s workflow. It’s worth watching to see how he does long-exposure shots with just his phone.